There's something amazing about Community-Supported Agriculture (CSA) boxes. Week after week, they're filled with fresh, organic and just-picked local produce. It never fails though, each box comes with at least one ingredient I’ve either never cooked with before, or perhaps never even heard of! Maybe it's Swiss chard (which can often be substituted for onions) or rutabaga (which can be roasted with other root vegetables). When my CSA box came with curly parsley and arugula, I was stumped. Both could easily be added to salads, but I wanted something different. Something a bit more fun, since we're already making salads with the lettuce that comes each week. As it turns out, arugula has a strong, peppery taste, while parsley has a very mild flavor. I didn't think either one were very tasty on their own, but I knew that together with a couple other basic ingredients they'd make an excellent smear for a fresh mozzarella and tomato sandwich. Traditional pesto calls for pine nuts, which are a bit too rich for my budget. This recipe uses cashews, an affordable, deliciously creamy alternative that still compliments the nutty Parmesan. 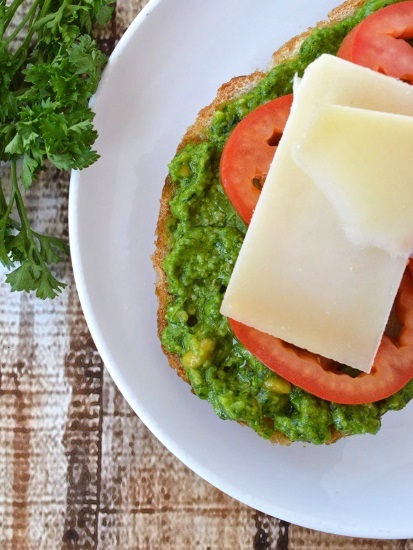 Sweetened with just a hint of honey, this bright green pesto smear has quickly become our new favorite recipe as we anxiously await the next CSA box, hoping to find arugula and curly parsley again. Directions Place all ingredients in a Blendtec Twister jar. Blend on speed 1 for a full cycle, twisting the Twister lid counterclockwise during blending. Use the Spectacula to scrape down the sides. Blend again on speed 2, for a full cycle, twisting the Twister lid counterclockwise during blending. The mixture should be creamy, but blend for a third time on speed 1 if any large pieces remain. Tiffany is a frugal foodie – passionate about feeding her family healthy food, while being a good steward of her family’s finances. She's a homeschooling mother of two, loving wife to one and a child of God blessed in more ways than she can count. She shares her enthusiasm for affording real food without going broke, and documents her baby-sized strides at Don’t Waste the Crumbs. Join Tiffany on Facebook, Pinterest or Google+ for encouragement and small, simple steps to healthier living.